Summon and Pilfer: Summon a random creature with cost 3 or less. Brellach Commander is an epic Willpower creature card. It is part of the Isle of Madness story set. "We must protect the wellspring." "They will fall before my blade." 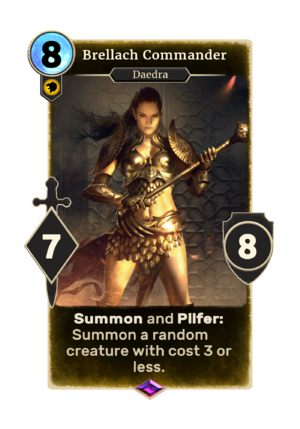 This card depicts Staada, the commander of the Golden Saints at Brellach, as she appeared in the Shivering Isles expansion for Oblivion. This page was last modified on 25 March 2019, at 11:49.